Read our comprehensive analysis on who will win? In Today’s Dream11 Fantasy Cricket Match Prediction of ENG-W vs SA-W 3rd ODI, we will cover probable playing 11, pitch report of St Lawrence Ground, Canterbury, fantasy cricket news and toss prediction. We will also cover all the latest news and details of South Africa Women Team and England Women Team, players recent and past performance, dream11 best teams, key players, the best choice for captain and vice captain, dream 11 guru and crictom experts prediction, weather report of Canterbury, where to watch the live match of SA-W vs ENG-W and details of the live streaming of ENGW vs RSAW, 23rd ODI (ICC Championship match), South Africa Women tour of England, 2018. All the details in this post are taken from very reliable sources and are well researched. Make sure to read the complete post to get 100% benefit. All the details in this post are absolutely free of cost and you don’t have to pay a single penny. We provide fantasy cricket tips, tricks, suggestions and news on every section of the post. Make sure to read each and every section of the post. To win any fantasy leagues like Dream11 and Myteam11, you need to have all the above information. The best part is you will get all the details on a single platform. Crix11 has done all the hard work for you. You just need to read the post, make your perfect winning team and start playing. Our strategy is very simple, we predict the players, the players perform and you win. As simple as that. Luck is an important factor but if you have the above details before playing any fantasy leagues, your winning chances increases. Where Can You Watch the Live Streaming of ENG-W vs SA-W, 3rd ODI or Channels to Watch? Who Will Win the 3rd ODI Match, Between ENG-W vs SA-W and Toss Prediction? What is the best combination of players for Dream11 and Fantasy Leagues for 3rd ODI Match? Date: The match will be played on 15th June 2018 (Friday). 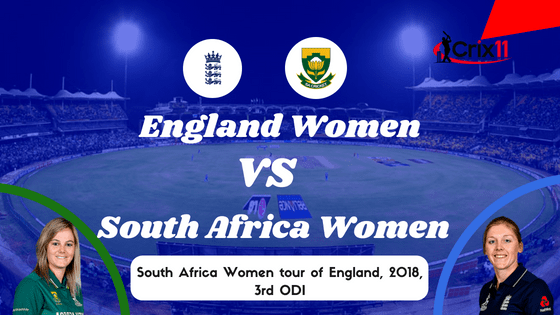 Match: South Africa Women tour of England, 2018, ENGW vs RSAW, 3rd ODI (ICC Championship match). Venue: Canterbury, St Lawrence Ground. The beauty of this pitch is, it favours all the three departments. It will be an average scoring game. However, the seamers will get extra help from the pitch. The seamers will get the swing in the initial overs. The batsman can score big only if they handle the initial swing. As the game progresses, the spinners will find some turn and if they bowl in the right area, they can disturb the batsmen. Most of the time, it will be partly cloudy in Canterbury, St Lawrence Ground. In the evening the sun will be out but only for a couple of hours. The cricket fans and fantasy users can get the complete game as no rain is predicted today. The temperature is expected to be 20-Degree Celsius and the humidity to be 55%, which may go up to 78%. The average first inning score of this ground is 245. The average second inning score of this ground is 217. Highest total on this ground is 272/5 in 50 overs by SA vs ZIM. Lowest total on this ground is 203/10 in 49.4 overs by KEN vs ENG. In last five matches, ENGW has won four matches out of five matches whereas RSAW has won only one game out of five games. In the last encounter, England Women Team has easily defeated South Africa Women. ENG-W has won the match by 69 runs. It will be interesting to see which team improves their record today. Sony Six and Sony Six HD has all the exclusive rights to broadcast the live coverage of ENGW vs SAW, in India and its sub-continent countries like Afghanistan, Maldives, Sri Lanka, Bangladesh, Bhutan, Nepal, and Pakistan. Heather Knight (c), Danielle Hazell, Sarah Taylor (wk), Sophie Ecclestone, Anya Shrubsole, Natalie Sciver, Katherine Brunt, Lauren Winfield, Jenny Gunn, Danielle Wyatt, Amy Ellen Jones, Laura Marsh, Tammy Beaumont, Georgia Elwiss. Dane van Niekerk (c), Mignon du Preez, Laura Wolvaardt, Sune Luus, Marizanne Kapp, Tazmin Brits, Lizelle Lee, Shabnim Ismail, Ayabonga Khaka, Raisibe Ntozakhe, Chloe Tryon, Zintle Mali, Andrie Steyn, Stacey Lackay, Masabata Klaas. England Women Cricket Team has bounced back with a quality performance to level the series. On the other hand, South Africa Women Team, after winning their first ODI, their bowling department failed in the second ODI. It will be interesting to see how both the teams make their playing 11 combinations for the third ODI. We will give you the playing 11 of both the teams in next section. After giving such a quality performance, we don’t think that ENGW will make any change in their playing 11 until and unless there is some fitness issue. Tammy Beaumont and Sarah Taylor are the top performers of ENG-W Team. Anya Shrubsole, Natalie Sciver, Tammy Beaumont, Sophie Ecclestone, Heather Knight (c), Amy Ellen Jones, Danielle Wyatt, Laura Marsh, Katherine Brunt, Sarah Taylor (wk), Georgia Elwiss. Although RSAW Team lost the last match against ENGW, they are very unlikely to make any change in their playing 11 as it was the same team who defeated ENG-W in the first ODI. Lizelle Lee, Marizanne Kapp and Shabnim Ismail are the top performers of SAW Team. Masabata Klaas may come in place of Stacey Lackay. Dane van Niekerk (c), Mignon du Preez, Stacey Lackay/Masabata Klaas, Lizelle Lee (wk), Marizanne Kapp, Ayabonga Khaka, Shabnim Ismail, Laura Wolvaardt, Chloe Tryon, Raisibe Ntozakhe, Sune Luus. Pro tips: Both the players are good and have performed in the previous matches. You can take anyone in your team. 70.9% of the dream11 fantasy users have selected Lizelle Lee and 29.1% of the users have selected Sarah Taylor in their dream teams. Fantasy Cricket Grand League Tips: Law of average says that Lizelle Lee may not score runs today and only 29.1% of the fantasy users have selected Sarah Taylor. So you can take her on your teams as this decision may make a difference. Fantasy Cricket Grand League Tips: If we look at the pitch, it will favour the fast bowlers and there are chances that the openers will get out early. So try to take middle order batsmen. Pro tips: The above players are most likely to contribute the most. Make a combination of the above players for multiple teams. Fantasy Cricket Grand League Tips: As the pitch will help the seamers initially. Marizanne Kapp is one of the most valuable players in today’s match. Keeping her in your team will be a wise choice. Fantasy Cricket Grand League Tips: Try to keep the bowlers who bowl first and second overs. They are most likely to take initial wickets today. ENGW has given a quality performance to level the series. The third and final ODI match will decide that who will lift the series. Both the teams are in good touch and have the potential to win the 3rd ODI, it’s just the matter of a day. According to our astrology prediction, ENG-W will win the third ODI. The Team winning the toss should bowl first as the wicket will help the seamers in the initial couple of overs. According to our astrology prediction, ENGW will win the toss and they will ask SAW to bat first. Note: This is our prediction for today’s match. This is just for entertainment purpose. We don’t support any kind of betting. All the information in this post is based on the news and our analysis and prediction. The wicket will favour the seamers in the first couple of hours so try to keep quality seamers in your teams. Try to keep quality batsmen in your team who can handle swing in the first couple of overs. The pitch will also favour the batsmen as the game progresses, so try to make a combination according to that. Conclusion: This is it for Today’s Dream11 Fantasy Cricket Match Prediction of ENG-W vs SA-W, 3rd ODI Match, which will be played on Friday 15th June. You can give your valuable feedback in the comment section. Subscribe to our notification of latest updates. GOODBYE!